Before I got pregnant with Baby Two Flowers I was making my own laundry soap. I haven't done that for a while. 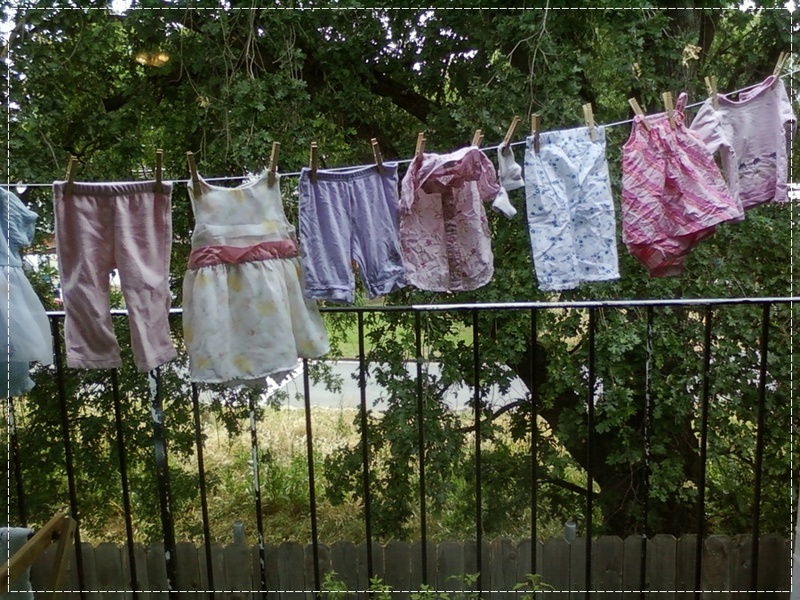 But now that the weather is nicer (in general) I am starting to dry our clothes on a line. I used to do that at our old apartment, but we didn't have any outside space there so our line had to be inside. I would read other blog posts or comments about how much softer laundry was if it was dried on a line instead of in a dryer, but I've always felt that dryer-dried laundry is softer and line-dried laundry is, well... crunchy! Now that we have a line outside I'm happy to say that our line-dried laundry is less crunchy than before. Now my only problem is that I only have enough line to dry about 1/2 of a load at a time. Sigh. 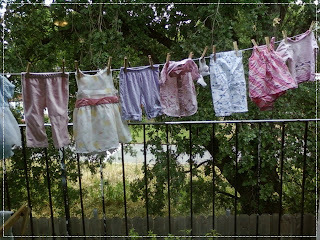 I just read this post called Laundry & Ironing by Design Mom. She says that "In France, everything is ironed..." and points out that "Running everything under the iron gets out wrinkles and softens fabric." Hmm. Maybe I should start ironing everything! I love her post, she has pretty pictures and it is neat to see how an American family is adapting to daily life in France. We have a clothes line too! we do the same back home.